How Deep is Long Lake? Long Lake Township of Grand Traverse County is a civil township. In the 2000 census, the population was 7,648 and in the 2010 census, the population had risen to 8,662. The town was first settled in 1862 by Ira Chase and his brother-in-law Eliphalet Fillmore. They were travelling from Whitewater to Grand Traverse County to choose land. Over the next few years, there were more and more people settling and clearing out forest to make farm land. A cycle of annual production started in the form of farming in the summer, logging in the winter and maple sugaring in the spring. Over time, more people began to settle in the new settlement. After the rise of the auto industry, younger residents moved to Detroit and Flint. Nowadays, the town is home to retirees and people who work in Traverse City. The township is built around Long lake, which is the largest of 20 inland lakes in the township. It is the water feature that they are best known for. The lake is located about fifteen minutes west of Traverse City. There are wood maps of Long Lake that are very easily accessible on the DNR website. The township and lake are a very popular tourist destination for many Michiganders and tourists from other state as well. There aren't any major inlets that flow into the lake and it is mostly spring fed. 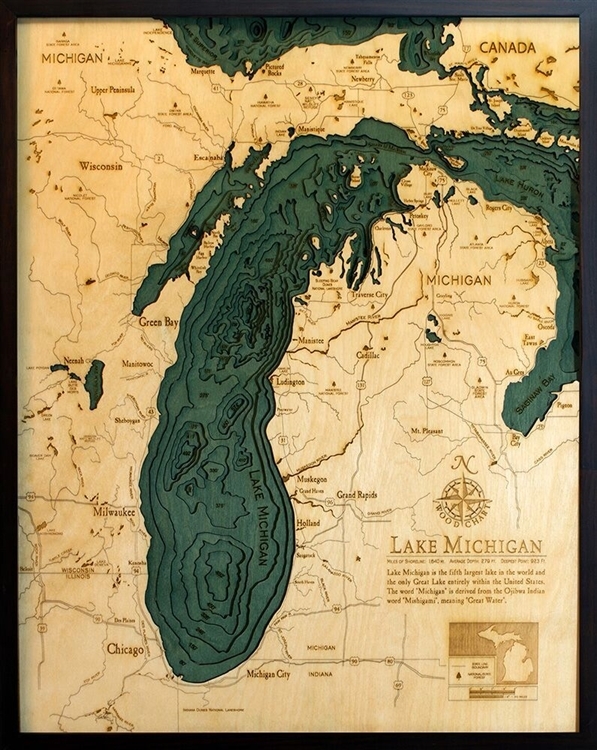 https://www.carvedlakeart.com/san-diego-wood-nautical-chart-map-p/sdgo-d3l.htm Check out carvedlakeart if you want the best deals on laser cut map, wood nautical chart in Long Lake Michigan, wood topographical map, and charts of the lakes, streams and oceans of the world. The surface area of the lake is about 4.5 miles and there are almost 17 miles of shoreline. The lake has an average depth of 26 feet with the maximum depth being 88 feet. There are many things to do on the lake which makes it such a popular destination. It has several islands, four of which are public accessible as parks. These islands are Long Island, Picnic Island, Fox Island and South Island. The lake is known for being a prime fishing location and its 4.5 miles are perfect for boating. Along with the islands being accessible, there are three parks as well along the shores. These parks are Taylor Park, Gilbert Park and Crescent Shores Park and boat launch. The Carter Strong Bird Sanctuary is a great tourist location as well. The bird sanctuary is located at the southwestern end of the lake and is a protection area. If rain is in the forecast and you are with children, you might consider a trip to Traverse City to visit the Great Lakes Children's Museum. This teaches the children about the Great Lakes and provides hands-on activities to keep them busy when swimming and going to the parks aren't an option. If looking for a bite to eat, the township has several notable restaurants. Boone's Long Lake Inn is a steak house in an old mill located on Secor Road. It is best known for the prime rib that people describe as legendary. They open at 4pm on all days except Sunday at noon. On the weekends, there is live music to enjoy. If you are willing to travel a short distance, Traverse City has a restaurant called Mulligan's Pub and Grill. Their signature food is stuffed burgers and sandwiches. If steak or burgers aren't on your menu, there is a local pizza chain called That'sa Pizza. They serve pizza and grilled sandwiches. This township has a lot of fun to offer and many parks to enjoy. The town is inviting and comfortable with a beautiful lake to top it all off. This is definitely a prime location for anyone looking to have a weekend at the beach or fish.